Bath robes can be hired for £4 each. If you fancy a paddle in the famous waters of Loch Ness, and haven't brought suitable footwear, please just ask, as we have a selection of wellies in various sizes. We also have a drying room where you can also dry clothes if you have been out in less favourable weather. If you are adventurous enough to try a swim, we have rock shoes in many different sizes that will help you get in to the water without slipping. We can provide a basic packed lunch, great for taking with you if you're going walking or cycling for the day. £5 per person. Please order the night before. If you prefer something a bit more impressive, you can pre-order a picnic basket to take with you on days out. Simply collect it at breakast time and return it when you get back in the afternoon/evening. Cost is £35 for 2 persons, and baskets include a variety of items such as home made quiche, pasta/bean salads, bread, tea/coffee, soft drinks and cake (items vary according to availability). If you wish to use our kettle barbeque on the beach, we are happy to supply you with charcoal, matches, utensils, plates, cutlery etc for a charge of £10. You are welcome to bring your own food to cook - the nearest supermarket is 10 minutes away, or the Dores Inn has been known to supply raw burgers for our guests to cook. An afternoon tea including tea, scones, clotted cream and jam is available on request for £5 per person. If you would like to take advantage of any of the above options, please give us as much notice as possible. Packed lunches and afternoon teas can usually be ordered at breakfast (although preferably the night before), but Picnic baskets need to be ordered at least 24 hours in advance. If you would like any of the luxury or romance options, please mention when booking where possible. We do not offer evening meals. 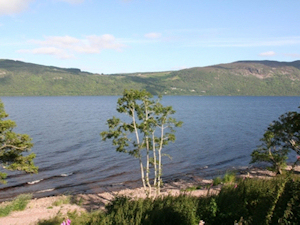 The nearest restaurant is the Dores Inn, 1 mile away. This is a popular pub, and the restaurant gets very busy at weekends and throughout the summer, so we advise you book in advance. You can contact them on 01463 751203 or info@thedoresinn.co.uk. You can walk there (please be aware that it is a quiet road, but there are no sidewalks or street lights), but they also provide a shuttle service so you do not have to drive. Let them know when you book that you would like to use the shuttle. Alternatively, we are lucky to have some excellent restaurants in Inverness, which is only a 15 minute drive from Balachladaich. We would certainly recommend The Rockpool, The Mustard Seed, The Kitchen, Riverside Cafe or Cafe No 1, but there is something to suit all tastes. We do not have a licence to sell alcohol, but are happy to supply you with corkscrews and glasses if you bring your own!